Thanks to everyone who stopped by our stand to taste and meet this year in Verona! It was another great Vinitaly. Looking forward to next year. Taste with the Cantele family at Vinitaly in Verona this year! Paolo, Gianni, and Umberto are looking forward to seeing you in Hall 11, Stand E2. Click here for more info. 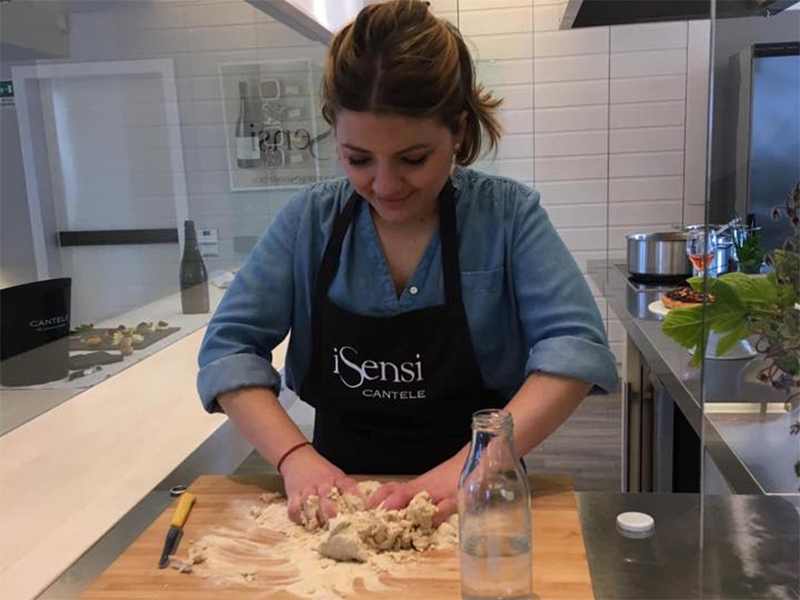 When you attend a wine tasting at Cantele’s tasting room and test kitchen iSensi, you don’t just taste wine — you experience wine. Guests at iSensi, like the group of Swedish journalists and restaurateurs above, not only taste the wines but also have the opportunity to pair them with classic Pugliese dishes and foods. And as these recent visitors did, they also get to lend a hand in making the food. No food and wine trip to Salento is complete with rolling out a few orecchiette! Interested in creating an event for your party at Cantele? Please visit the iSensi page for details and reservation info. Anyone who’s ever tasted Cantele wines or had a chance to visit the Cantele winery in Salento already knows that design is a big part of the Cantele ethos and philosophy. From the wine’s bottle shapes and labels to the Cantele tasting room iSensi at the estate, every detail and every design choice is meant to evoke the Cantele aesthetic. That’s one of the reasons that the Cantele stand at Vinitaly, the annual Italian wine trade fair in Verona, is always one of the fair-goers’ favorites: It is an artistic “space” that reflects the Cantele style, modern and clean yet warm and “human” in its perspective. You can see a preview of our 2019 Vinitaly stand here on our Facebook. We hope to see you this year in Verona! For our friends and colleagues attending Vinitaly in Verona this year (April 7-10), we are pleased to share the news that leading Italian wine writer and expert Daniele Cernilli (above) will be pouring one of our wines at an exclusive event. It’s a really impressive flight of wines and we couldn’t be more thrilled to be part of it. Click here for details and registration info. There are only a handful of spots available. Taste with the Cantele family at Vinitaly in Verona this year! Paolo, Gianni, and Umberto are looking forward to seeing you in Hall 11, Stand E2. It’s always nice when a wine writer recommends your wine. It’s even nicer when a top wine writer recommends your wine on the number one wine blog in the world! We couldn’t have been more thrilled to learn that veteran wine writer and New York Times contributor Stacy Slinkard included Cantele’s Salice Salentino in her post this week on “the Best Italian Red Wines for Beginners” on Wine Folly. Click here for her post and for the other Italian red wines and producers she recommends. Thank you, Stacy! And thank you, Wine Folly! Since 2013, the Xylella fastidiosa (Pierce’s Disease) crisis in Salento has continued to decimate the region’s olive groves. In some instances, families who have been growing olives and milling olive oil for generations have lost their livelihood thanks to the unforgiving pathogen. These days, the peninsula, once teeming with resplendent olive groves, is dotted with dead and abandoned trees — many of them centuries old. Some progress has been made in developing olive cultivars that are resistant to the disease. As saddened as we are by what’s happening on the ground in Salento, we were pleased to see this CBS Sunday Morning story about the crisis. Why did winemaker Gianni Cantele post this picture of himself with Cantele’s longtime vineyard manager Cataldo Ferrari and a horse? It’s because the Cantele team has been using a horse-drawn plough to de-grass its vineyards this year. Over the last decade, the Cantele family has been working toward a goal of 100 percent sustainable farming practices. Even though the Cantele winery isn’t organic certified, the majority of fruit used to make its wines is organically farmed — i.e., without the use of synthetic herbicides or pesticides. Even in those cases where synthetic products are used, they are applied as sparingly as possible. It’s a reflection of a growing movement of grape farmers in Italy and Europe who are practicing a new and novel approach to sustainability in the vineyards. Just like every time our English-language blogger visits the winery, he asks to be taken for a puccia — Salento’s famous “anything goes” sandwich (above). Across the city of Lecce, you can find sandwich shops that serve just one type of sandwich: The puccia (pronounced POO-chah), a made-on-the-spur-of-the-moment flatbread that can be stuffed with a wide variety of ingredients. In another era, Lecce — the ancient capital of the Salento peninsula — was one of the richest cities in the western world. A hub between the east and the west, it was a major commercial center for trade and transport. And thanks to its stature, it was also a cultural center where Greek and Balkan traditions blended in with Roman and later Italian science and arts. By the end of the 17th century, Lecce had also become renowned for its unique style of baroque architecture.